Far fewer people in Bangladesh have safe water than the state government has estimated, new research shows. In addition, many people who do not have access to safe drinking water are under the mistaken impression that their water is safe, drinkable, and clean. 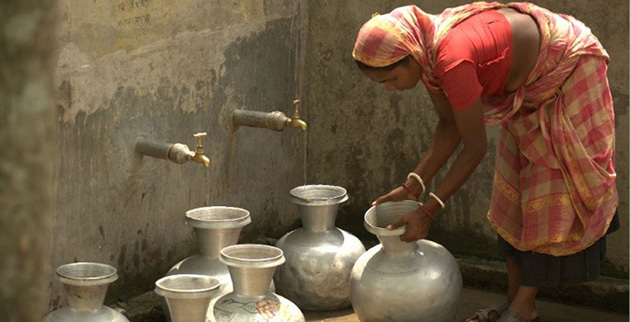 According to the latest national assessment, 85 percent of the people in Bangladesh have access to safe drinking water. However, the new research uncovers two major problems that the national statistics don’t reflect. “The most surprising and disturbing result of this research was discovering that, in the communities we studied, there was almost no reliable year-round access to safe drinking water, while most residents did not know that their water was unsafe,” says coauthor Jonathan Gilligan, associate professor of earth and environmental sciences at Vanderbilt University. “Even when almost all water was unhealthily salty and had unsafe levels of arsenic and other chemicals, most people reported that the water tasted good and used it regularly,” adds Gilligan. The paper describing their results appeared last June in the International Journal of Environmental Health Research. It is available for free to mark this year’s World Water Day on March 22. Working with Bangladeshi collaborators, team members spent many weeks in southwest Bangladesh over several years, conducting interviews and surveys to learn where households got their water. They also measured water quality in both rainy and dry seasons. They found that during the rainy season most people collected rainwater, which provided them with an ample supply of safe drinking water. During the dry season, however, they discovered that the inhabitants relied on pond and well water that frequently contained unhealthy levels of arsenic and other contaminants. “Fixing a problem begins with knowing that there is a problem, so we are continuing to work with colleagues in Bangladesh to extend this research to many more communities and to raise awareness of these critical issues,” Gilligan says. Coauthors of the study are from Vanderbilt; the University of Colorado at Boulder; and Khulna University in Bangladesh. The Office of Naval Research grants supported this work.